Available in assorted colors, sizes, and patterns. A strong, cohesive, flexible bandage! An excellent pressure or support bandage. Will not cut off circulation. Easy to apply but provides reliable holding power. It adheres to itself, but not to hair or skin. No fasteners, clips, or pins are needed. Lightweight, porous, soft, and comfortable. 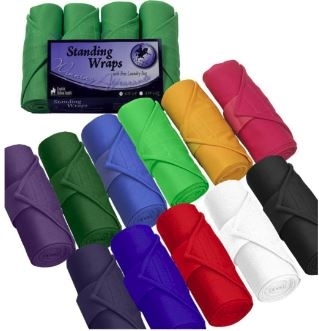 Constructed from top quality brushed pile fleece, these leg wraps provide your horse with the leg support needed during strenuous workouts. Hook and loop closures for easy on and off and a convenient machine washable design make these leg wraps perfect for the busy horseperson. Measure 4-1/2" wide x approximately 9' long. Sold per set of four. These quilted broadcloth wraps have a bound poly filler. Measure 14" wide by approximately 27" long. Machine washable. Set includes four leg wraps. 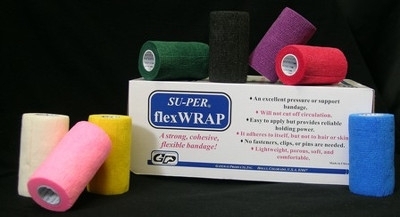 A strong, cohesive, flexible bandage! 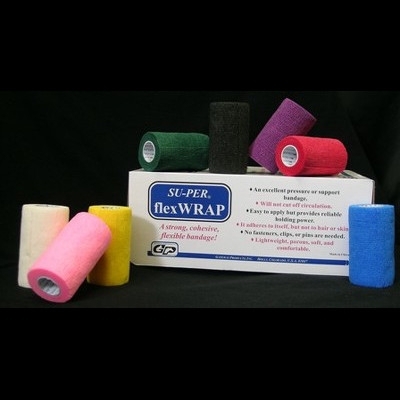 An excellent pressure or support bandage. Will not cut off circulation. 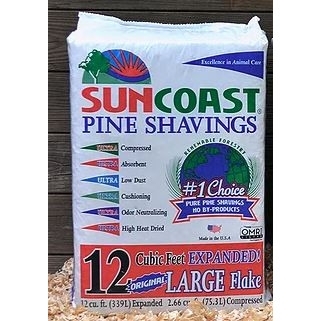 Easy to apply but provides reliable holding power. It adheres to itself, but not to hair or skin. No fasteners, clips, or pins are needed. Lightweight, porous, soft, and comfortable. 4” x 5 yards (stretched) and 4” x 2.2 yards (unstretched).